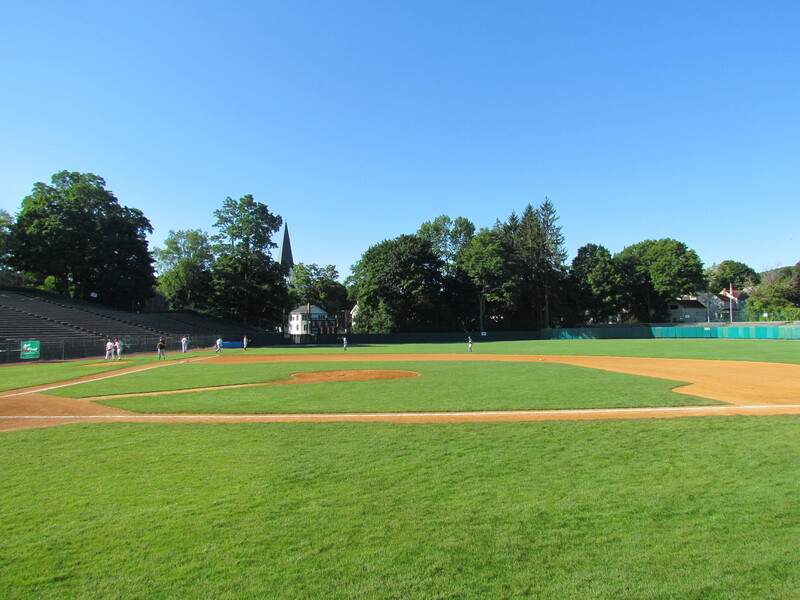 Cooperstown, NY is a necessary pilgrimage in the life of a baseball fan, or so I am led to believe, so I was naturally buzzing about my recent opportunity to see the Baseball Hall of Fame on returning from a family vacation to Montreal. I was warned beforehand that Cooperstown was in the middle of nowhere, but that phrase is as overused as “be careful, your plate is really hot,” by waiters carrying mildly warm plates. As it turns out, Cooperstown is indeed in the middle of nowhere and the French Canadians actually serve scorching platters. I wasn’t prepared to travel over a river, through some woods, between barns in Amish country, and around bends on a mountainside to be spat out on a main street belonging in the early 20th century. The whole thing felt as though I fell through a rabbit hole into a utopian town that has frozen baseball in time—from the 1800s to the present day. I could sit here and write all about the awesome history of the game and the storied artifacts of the most important moments in baseball history, but if you really cared about that you would have already experienced it for yourself in Cooperstown. Instead, I present to you every last artifact of the Florida/Miami Marlins that I could find. The longtime Mets and Dodgers catcher was a member of the Florida Marlins for approximately nine days in the 1998 season. He is, by my rudimentary count, just the second player in the Hall of Fame to ever play for the Marlins. Andre Dawson is the other, and he played two whole seasons in Florida! 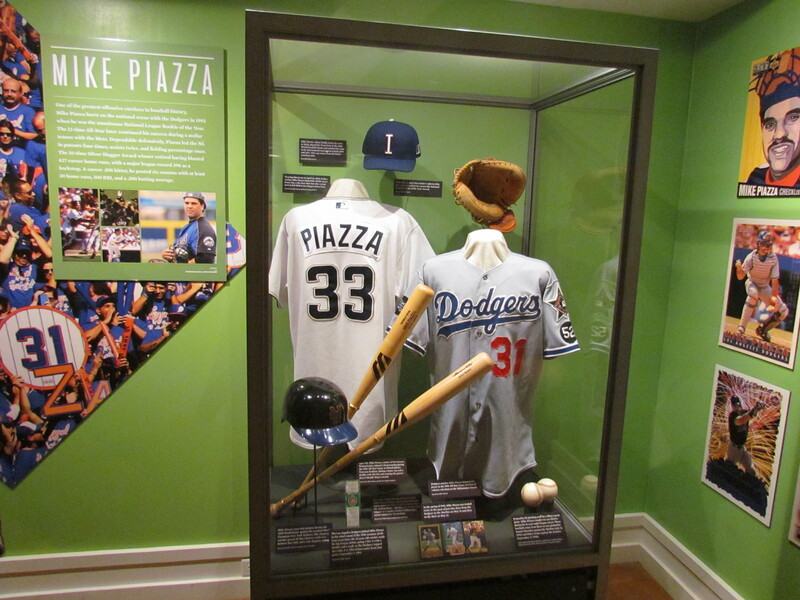 Piazza and Ken Griffey Jr. are the newest members of the Hall, so they have much appreciation currently. The only Marlins Piazza memorabilia I could find were baseball cards— one in the main Piazza case and dozens more upstairs. Apparently, over 120 different baseball card designs of Piazza as a Marlin were produced in his week with the team. The winner of the 2011 Ford C. Frick Award is honored in the “Scribes and Mikemen” exhibit on the first floor of the museum. Van Horne, as it turns out, started professional baseball broadcasting with the Richmond Braves in Virginia. He took the radio mic with the Marlins in 2001 and has been on the air in South Florida ever since. I was more intrigued by the clubhouse room than any other. Each team has a locker dedicated to artifacts from the last decade or so. Inside the Marlins’ is a number 27 jersey that surprisingly does not belong to Mike/Giancarlo Stanton. It was Jeremy Hermida’s when he hit a grand slam in his first career at-bat. Also encased are cleats from both Henderson Alvarez and Stanton during Alvarez’s closing day no-hitter in 2013. 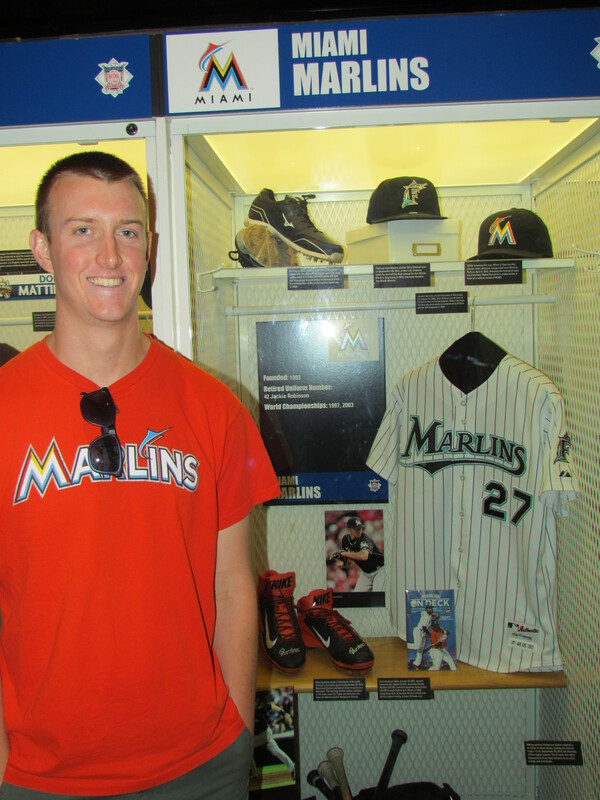 There are two hats–one Florida and one Miami–that were worn by the Marlins starting pitchers in the final game at Sun Life Stadium and the first game at Marlins Park. Chris Volstad and Josh Johnson, respectively, started those games. And sitting on the bottom of the locker are four bats–one each belonging to Mike Jacobs, Dan Uggla, Hanley Ramirez, and Jorge Cantu. Those players comprised the starting infield of the 2008 Florida Marlins, who were the first ever infield to have each member hit 25 or more home runs in a single season. They would have all finished with 30 or more had Cantu knocked just one more dinger that season. One of my favorite players of all-time is honored in the Viva Baseball! exhibit, celebrating the Latin American stars of the game. 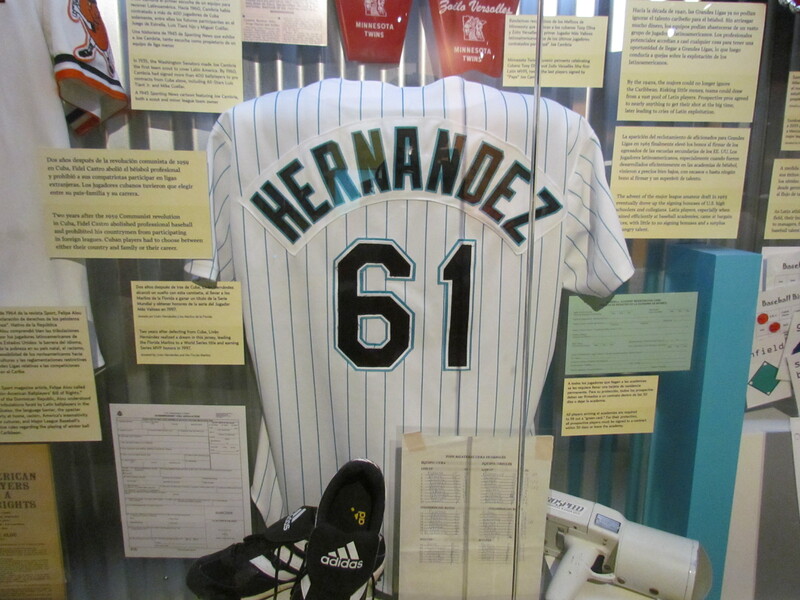 The Marlins jersey was worn by Hernandez during the 1997 World Series, of which Livo won the Most Valuable Player award. The last ever flapless batting helmet was retired in 2002 when Tim Raines played the final game of his career for the Marlins. 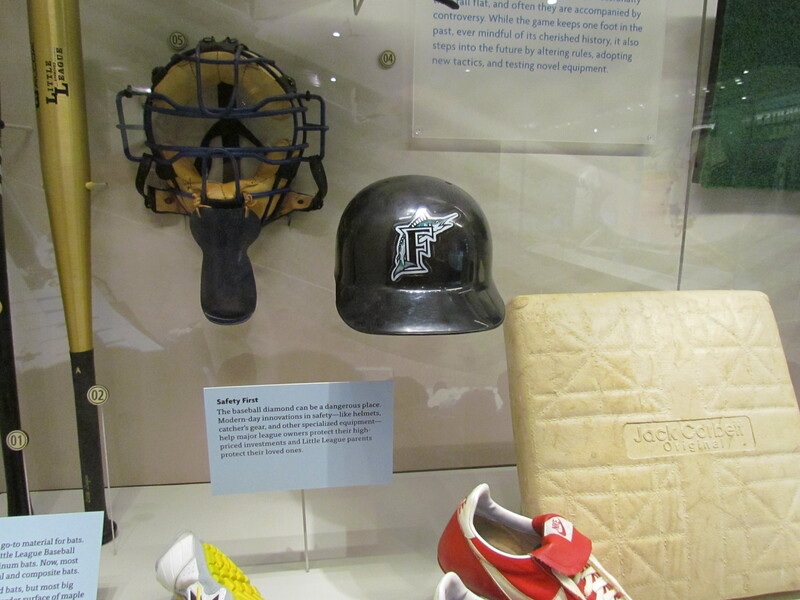 Raines was grandfathered in after a 1983 rule required batting helmets to be equipped with ear flaps. A pennant commemorating the inaugural year of the Florida Marlins franchise sits next to a Colorado Rockies counterpart. In an exhibit illustrating the quick success of expansion franchises sits the cap worn by Kevin Brown during his 1997 no-hitter. 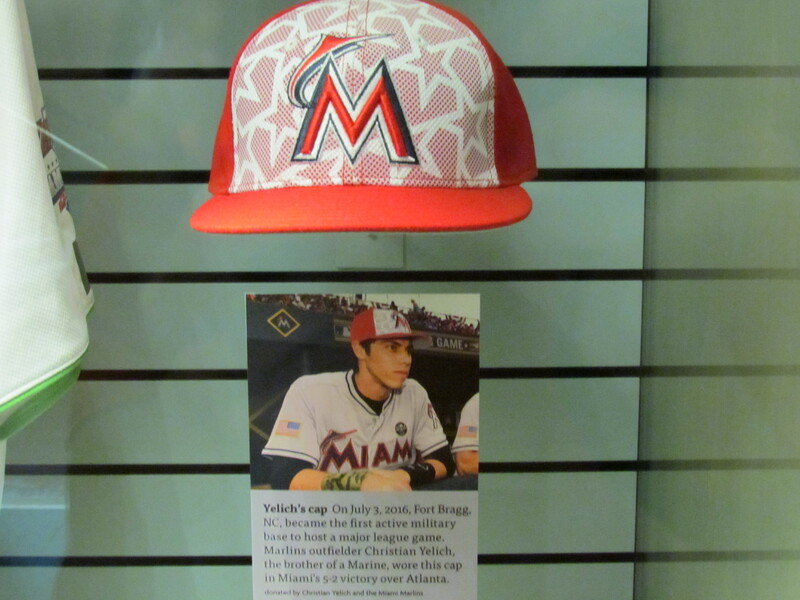 Perhaps the newest piece of memorabilia on display anywhere in the museum is the cap worn by Christian Yelich during Miami’s July 3 game at Fort Bragg, NC–the first ever MLB game played on an active military base. Signs from the 1997 World Series between the Marlins and Indians both cheer and jeer the Fish. In addition, rings and pins from both Florida World Series victories (1997 and 2003) are displayed. Finally, the cleats worn by Craig Counsell as he scored the winning run in game seven of the 1997 Fall Classic remember that the chicken does indeed run at midnight.